There are numerous window styles and materials available today. It helps if you familiarize yourself with the features and benefits of different replacement windows in Chesterfield, MO. This way, you know what to look for once you meet with your installer. As for materials, look for energy-saving options. At Renewal by Andersen®, our windows come with various glass packages that offer heating, cooling, visible light transfer, and UV protection benefits. They come with durable and insulating Fibrex® frames for added energy savings. Working with a reputable Chesterfield, Missouri, windows company means that you can get the best services for your home. This type of installers usually have years of experience under their belt and have factory training to back up their skills. They also have a list of references so you can check out past projects. 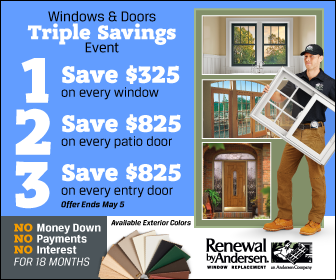 Renewal by Andersen of St. Louis employs locals to install your windows because they underst and what type of windows you need. After every installation, we conduct a customer survey, and over 92% say that they are likely to recommend us in the future. We also carry the Andersen name, which is synonymous to quality. As the replacement window division of the Andersen Corporation, we do our best to offer quality windows for your peace of mind. Warranty covers any issues you may have with your windows after installation. This typically lasts for a period, depending on the window company. Renewal by Andersen, for example, covers window glass for 20 years, components other than glass for 10 years, and 2 years for installation. Whether you’re looking for Chesterfield doors or windows, Renewal by Andersen is a name you can trust. We have the experience, products, and warranty that you are looking for. Call us today at (314) 332-2364 to learn more about our products and services. You can also schedule a free in-home consultation through our contact form.